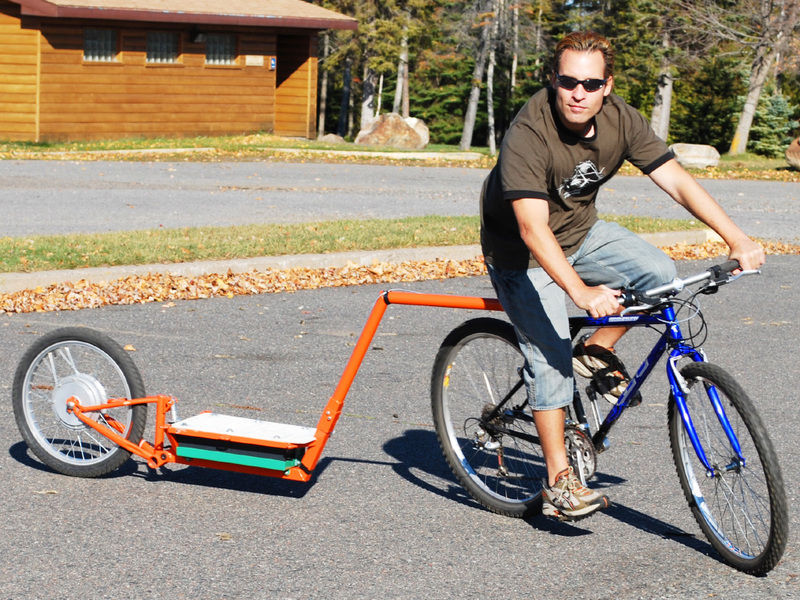 This DIY Electric Trailer Pushes You Around! The Atomic Zombie CycleBully electric assist bicycle trailer is robust multipurpose cargo trailer that includes a suspension system and an electric motor that can push your bike or trike up to city traffic speeds. 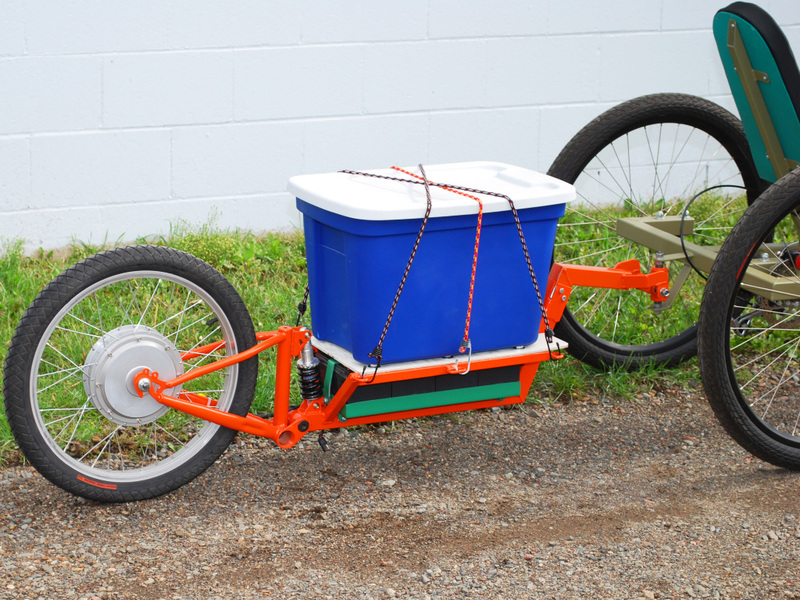 This DIY electric trailer plan shows you how to turn a few standard bicycle frame parts and some steel tubing into an electric cargo trailer that will allow you to effortlessly move a hundred pounds or more. Tackle massive hills with ease! 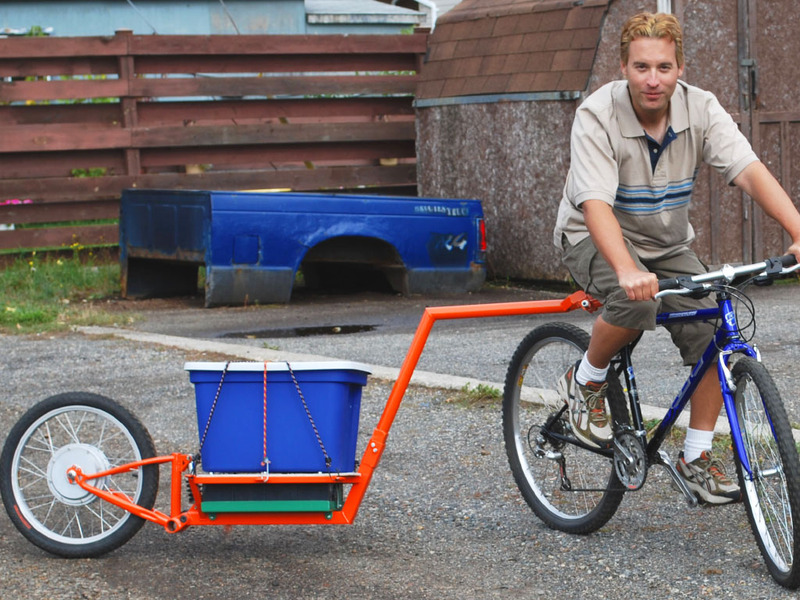 Top speed and range are determined by the choice of hub motor kit, so you can tailor this DIY bike trailer to your own needs and budget. Make a trailer that will kick you up to city traffic speeds, or make a super long range commuter to run all day long. The unique feature of the CycleBully electric trailer is that it has only a single wheel, yet will remain upright on your bike or trike. Using an easy to build dual axis hitch, this electric assist cargo trailer will adapt to any upright bicycle or recumbent vehicle and will always remain upright. Because of this single wheel and suspension design, your cargo will enjoy a smooth ride and you can navigate narrow trails or ride along the side of the street without adding any extra width to your vehicle. 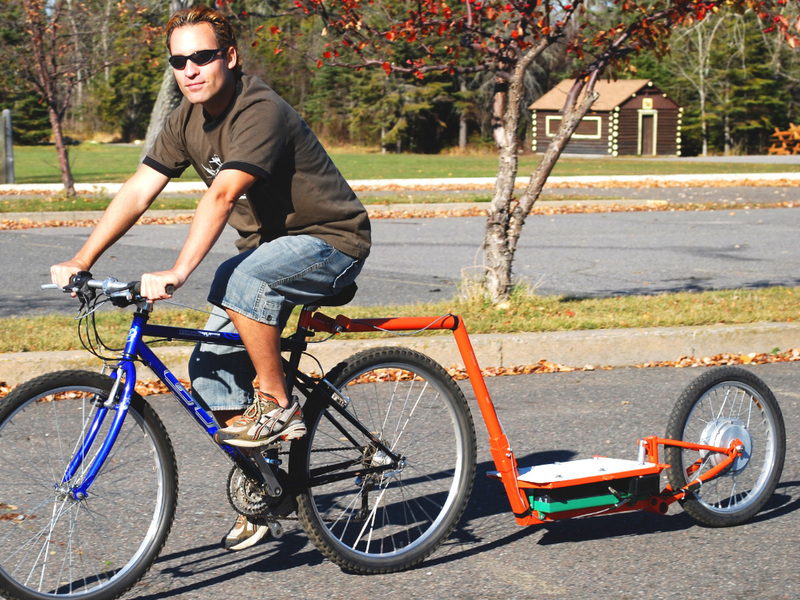 This DIY bike trailer plan also includes an adaptable hitch arm that can connect to any bike or trike, no matter how low to the ground or tall it may be. Our plans are all about making this work for you, so you can modify just about any part. 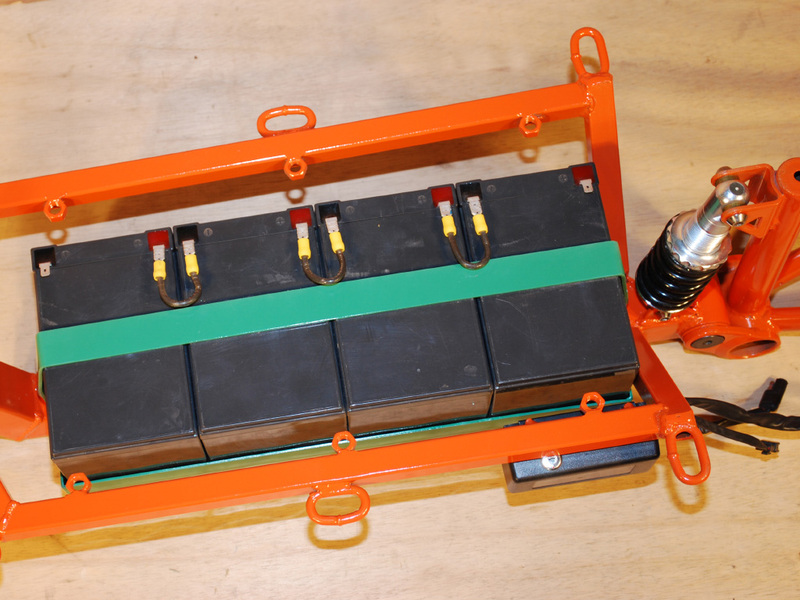 The CycleBully electric assist trailer includes the battery pack under an adaptable flatbed that allows any type of cargo box or carrier to be installed. All of the weight is carried by the rear suspension, so your battery bank and cargo will always get the smoothest ride possible on hostile terrain. 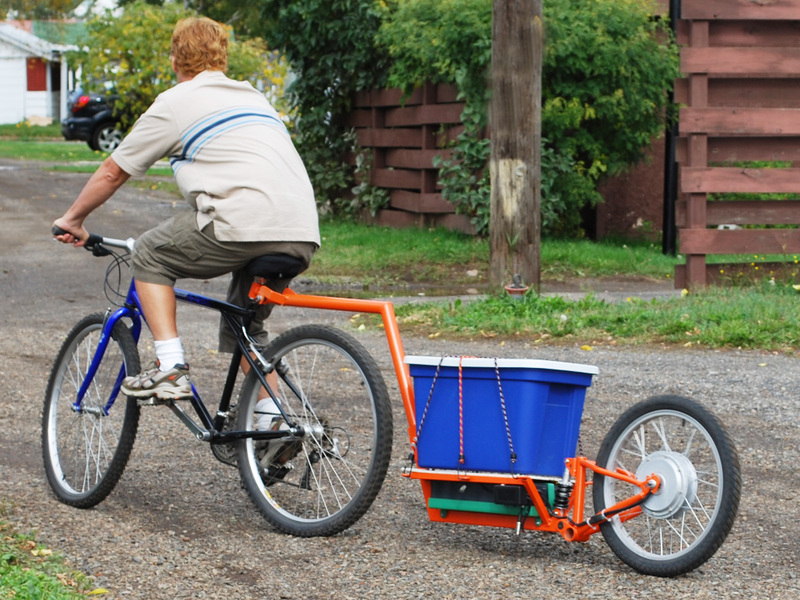 Because the trailer hitch is removable at the front, you can reconfigure this DIY bicycle trailer in a few minutes from one bike to the other, no matter how different they both are. The electric hubmotor on the CycleBully can propel your bike for an hour or more at speeds that come close to the legal city limit, allowing you to safely drive in traffic with a heavy payload. 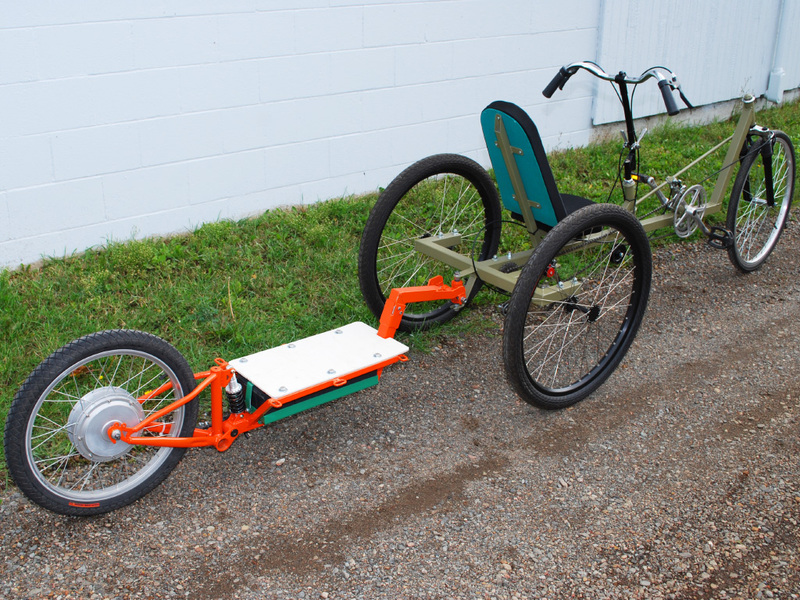 On a recumbent trike, the CycleBully electric trailer will remain upright, allowing the hitch to move side-to-side or up and down as the trike makes turns and drive over uneven ground. This completely stable electric assist trailer will push you along at any speed, and not effect the feel of your ride in any way. Because the battery bank is positioned low, the rear drive wheel will maintain constant traction and the trailer will not affect the handling of your bike, remaining almost invisible even when carrying a large load. 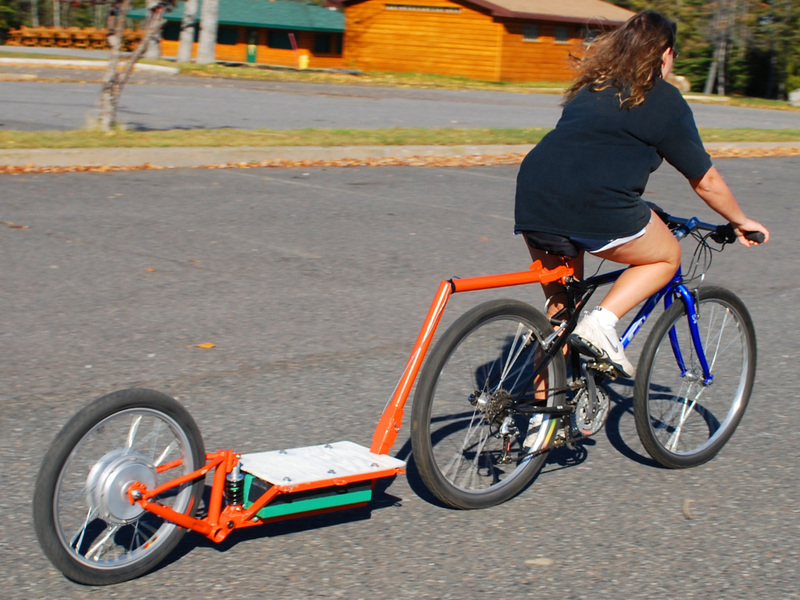 Adapting to an upright bicycle is easy with the DIY detachable trailer hitch, which allows you to create an arm for every different bike or trike you own. With our easy to follow plan, you can build your own electric cargo trailer in a few days using only basic tools and materials. Salvage old bike parts and scrap metal to make all of the components. Nothing used is difficult to find or expensive in any way. Bolt On Your Motor and Ride! A bicycle hubmotor kit is a very efficient electric motor that is laced into a standard bicycle wheel. When you purchase a hubmotor kit, it will come with the wheel of your choice and all of the parts necessary to connect it to a bicycle. All you have to do is plug the battery bank into the charger and then you will be ready to go, riding on clean, efficient, and totally silent electric power. For extended range, you can easily create a new battery pack with larger capacity for extended range of 50 miles or more on a single charge. Acceleration with an electric assist motor is extremely strong, so you can climb practically any hill as you bring home a load of heavy groceries or cargo. Depending on your choice of motor, you can expect between 2 to 10 times the power of just your legs alone. Make Your Own Creative Modifications. Every single step of the build is shown in great detail, and the plans assume you have only the basic tools. You can easiliy adapt this electric trailer to any bike or trike, even those that you have built yourself. The cargo area is also easily adaptable to the type of payload you intend to carry. Shown here as a flat deck, you can easily strap down large objects using the handy tie down loops. You can also alter the size of the frame for huge cargo capacity. Run on Silent Electric Power For Pennies per Charge. This DIY power assist trailer weighs less than a car wheel, and can be built for the cost of one tank of gas in your SUV. Feel the amazing power of the electron as your silent running, clean energy trailer pushes you up to speeds not possible by human power alone. No need to worry about that 2 mile long steep hill coming up, just engage the throttle and let the motor do the work for you, even fully loaded with cargo. If you have been looking for a way to leave the car at home and get a little fresh air, then this project is for you. Thanks to the electric assist motor, you can make the trip in less time on your bike or trike than you could in the car, and it will certainly be a more enjoyable journey.